A year ago, AMC was a bumbling cable network sending cease and desist letters to fans of Mad Men who lovingly Tweeted in the names of the show’s characters. They demanded the accounts be suspended until someone apparently pointed out that all this adoration of the show was – doh! – good for the show. As season three approaches, (launching August 16th) they’ve more than wised up; they’ve embraced social media and its evangelistic ability to create buzz. Will that buzz bring create new Mad Men fans, or just excite the show’s existing base? Stay tuned. 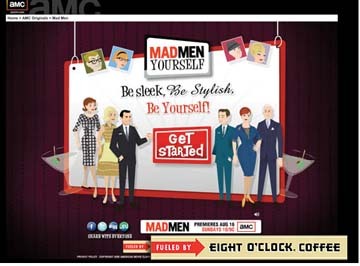 “Which Mad Man Are You?” a trivia game, and “Mad Men eCards,” will launch next week. AMC hopes the cards, featuring “Mad Men” characters and messages like reminders about the next episode’s date/time, will be shared, and encourage viewing parties and virtual chatter about the show. Banner ads on AMC’s site will link fans to the ecards. All three apps can be used through Facebook, Twitter, iPhone and AIM. All three apps are sponsored by Eight O-clock Coffee, which does no traditional advertising. Eight O’Clock doesn’t seem to quite get how to make the most of their sponsorship. Oddly, opportunity is being missed as the promos are not mentioned on Eight O’clock’s homepage! And no announcement has been made about an Eight O’Clock product placement in Mad Men episode. In previous seasons, Martinson’s was the coffee account that the fictional agency Sterling Cooper represented on the show. Perhaps, muses Ron Callari in Investor Spot, a plot line will involve Sterling Cooper dropping Martinson to pick up Eight O’Clock, the way they dropped Mohawk Airlines last season so they could take on American Airlines. With several Emmy’s under its belt, wild acclaim from the critics, and adoring fans, Mad Men on AMC has only been able to attract slightly less than 2 million viewers during its second season. Its embrace of social media this season is sure to become an oft-repeated case study of successful use of social media. My bet is that the story will include how greatly the campaigns increased not just buzz, but also eyeballs. 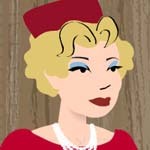 Another cool thing about Mad Men Yourself is how they used the talents of illustrator, Dyna Moe, who has created original art featured on the fan blog, Basket of Kisses (lippsisters.com). As a reader of that blog, it delighted me to see AMC/Deep Focus involve the BoK community in this way. Smart.